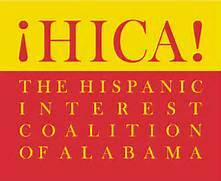 Hispanic Interest Coalition of Alabama – United Way of Central Alabama, Inc.
¡HICA! views immigrant integration as a dynamic, two-way process in which newcomers and the receiving society work together to build secure, vibrant, and inclusive communities. It is an intentional process that engages all community stakeholders and enriches our social, economic, and civic life. Integration matters so that we can all live in a healthy community that creates a sense of belonging for everyone, and that creates opportunities for all to improve their lives. ¡HICA! is dedicated to the social, civic and economic integration of Hispanic families in Alabama. ¡HICA! envisions an Alabama in which everyone has full and equal participation in our state’s civic, cultural, social, and economic life. Hispanic and immigrant families are empowered to integrate, engage, and lead their communities to reach their families’ aspirations. To improve the lives of Latinos in Alabama through coordination with existing community resources, providing transitional services and education.